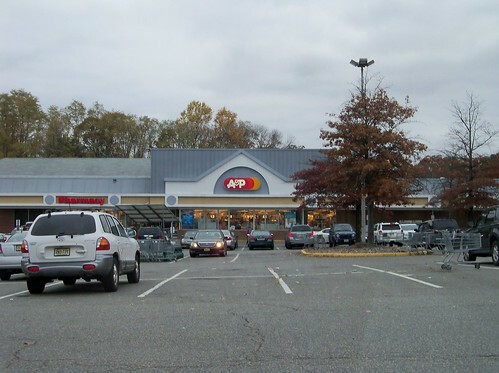 The Good 'Ol A&P in Marlboro, New Jersey; which had one of the oddest 90's Flagship model expansions on earth, closing with the rest of the chain in 2015, is finally opening as a Key Food Food Emporium by April. The store is going to bring the New York standards to Marlboro... but is it really? You can see the odd centennial awning on the left side of the building. Previously in Marlboro, A&P had planned for a new 90's Flagship model on the other side of town, but plans were scrapped at the last minute, and the building briefly turned into an Acme. A Pathmark was also open up until the acquisiton by A&P. This store actually took Pathmark's pharmacy sign, as seen above to the left. As Food Emporium prepares to open, I'm thinking Will The Store Stay In Town? Most A&P acquisitions from Key Food were failures, take for instance Edison, Port Chester, and Garwood to name a few. Once this store opens again, I will include pictures of the interior. No pictures are available at this time, but if I remember correctly, this store had a basic "Fresh 1.0" remodel.